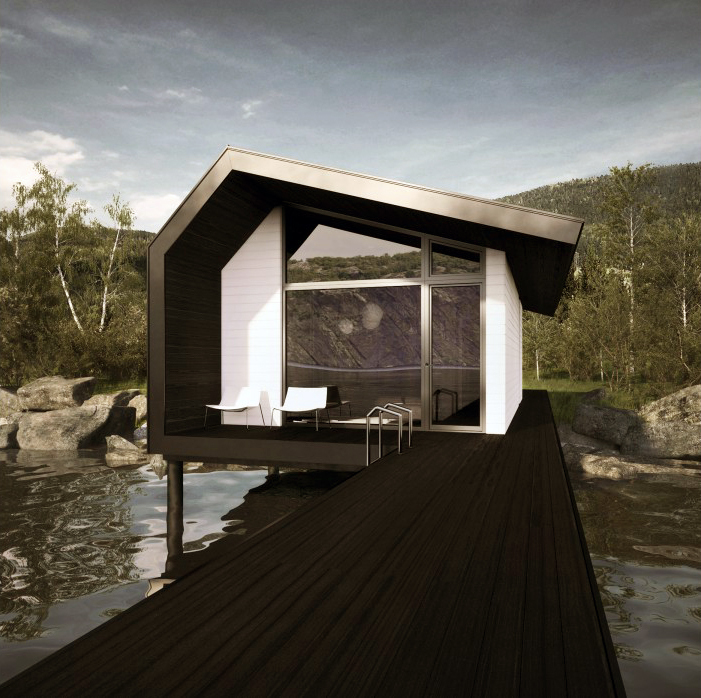 FISHER'S house is a cottage located on the Clear Lake in Canada. It is designed for an active young family. 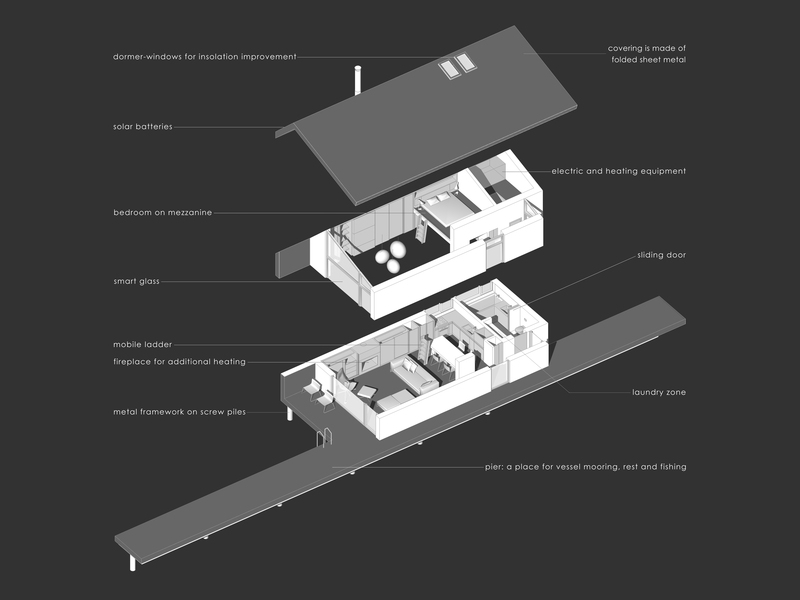 Projecting FISHER'S house we apply a rational approach to designing compact, economical and ecologically friendly housing and take into account the customer’s initiatives and individuality. The project provides a nontrivial solution to a cottage for rest and communion with nature. The basic principles of the project are its autonomy, environmental friendliness, rational layout as well as logical shaping of form. The Customers expressed the desire to project a house where comfortable accommodating wouldn’t conflict with inviolability of the nature. The site is located on the Clear Lake in Canada and considerably distant from the nearest settlements and communication networks. According to the Customer’s desire the house should unite all the advantages of the site. Thence, the main idea was decided to be the joining link between land and water. Form shaping is based on wrapping up the primary volume. A simple orthogonal form is the core of the project. 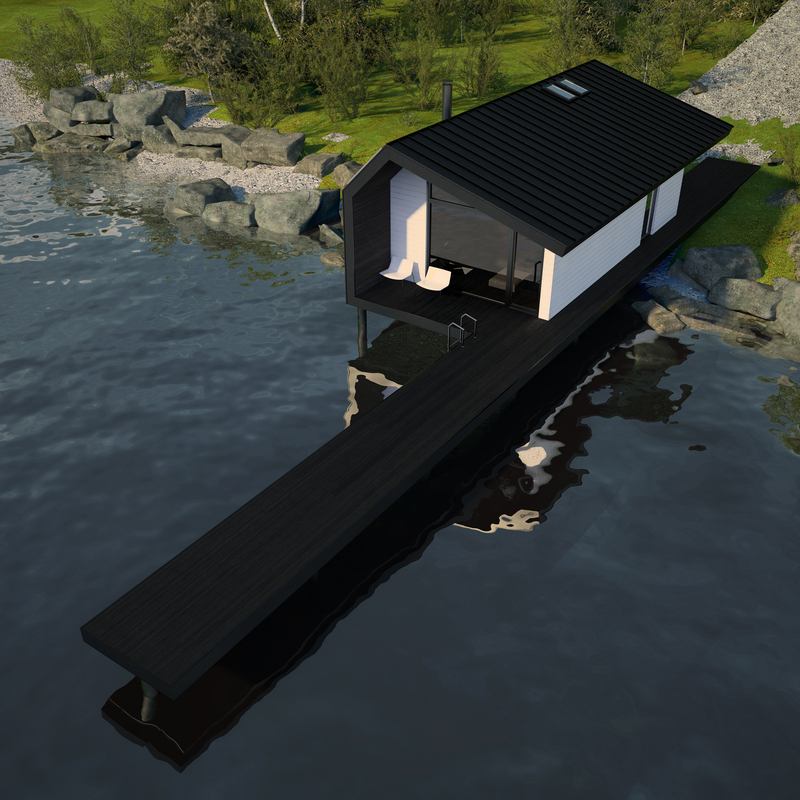 The main transit way inside follows it and allows you to make a straight line, both outer and pass-through, from the shore to the water. House volume forming is completed by wrapping the core with a planar structure. Planning solution involves the main functional areas and premises displacement alongside the main transit way, the axis of which is the north wall of the house. The interior volume of the accommodation area is represented by an ample room with the panoramic window with a view on the lake. The project applies interpenetrating spaces principle. 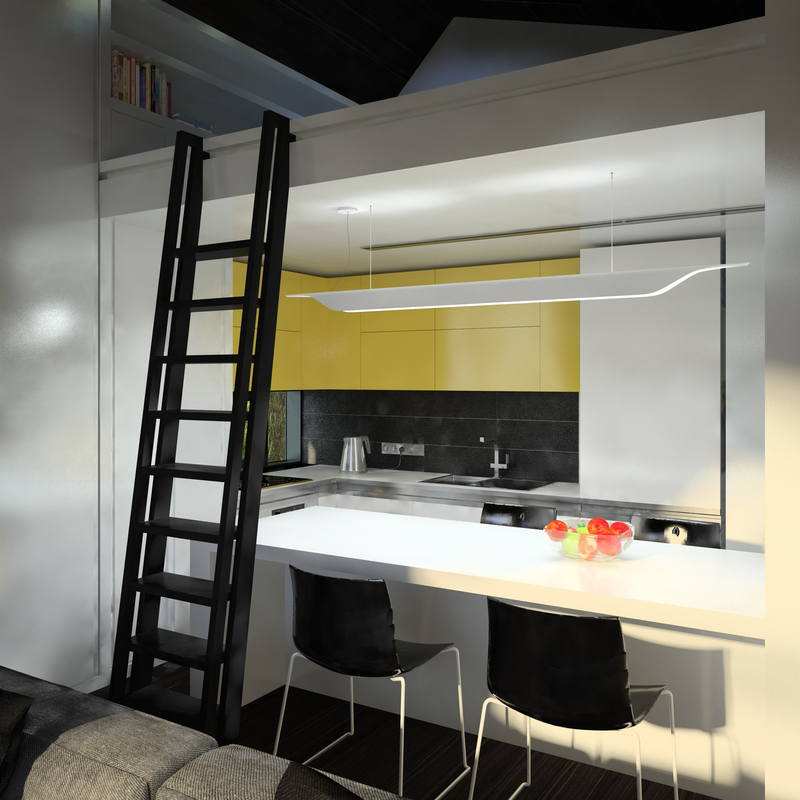 The bedroom is on mezzanine above the kitchen area. Lavatory facilities are located in the north-western part of the house. 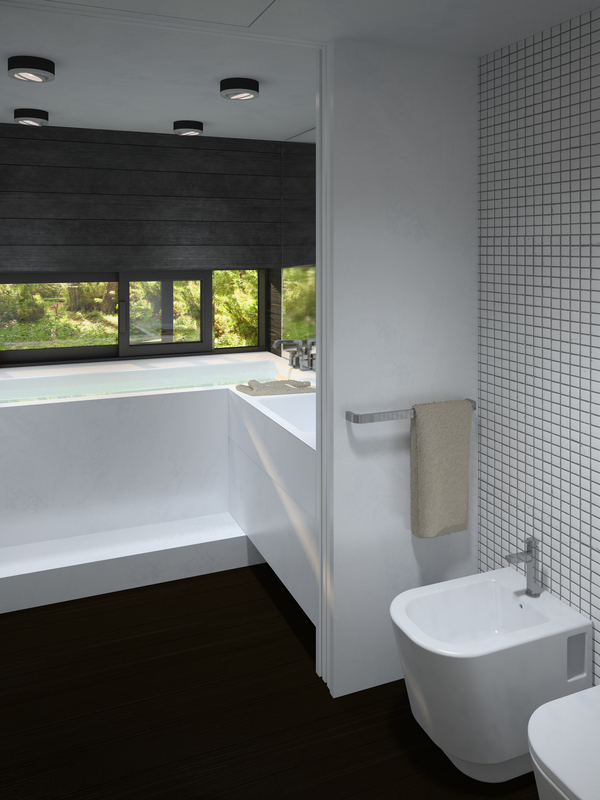 They consist of a bathroom and a toilet room that are separated by sliding doors. The technical floor is placed above the lavatory facilities and is intended for engineering equipment. Outer space of ter and pier allows one to organize outdoor recreation. Pier length considers possibility to moor a small boat. 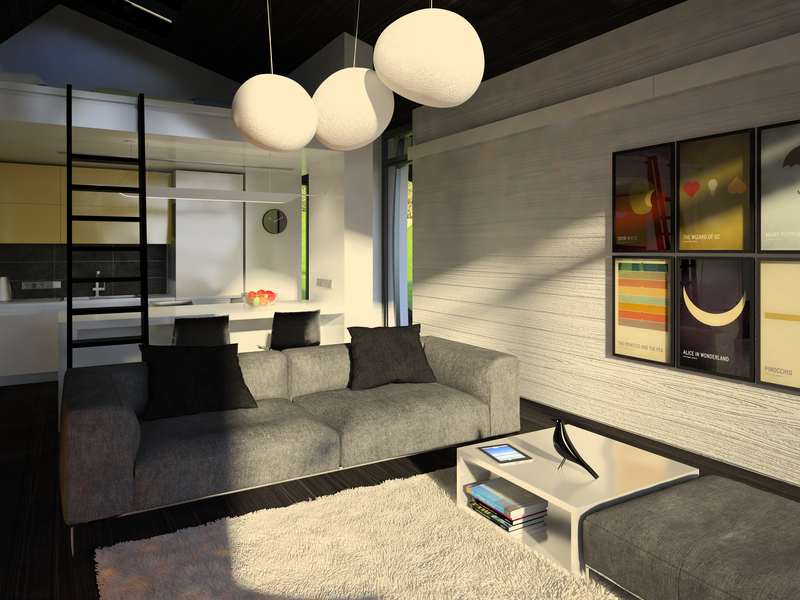 Interior concept is based on visual consistency of internal and external room. Therefore the principle of open plan is applied and considered a large area for glazing to go with the concept. 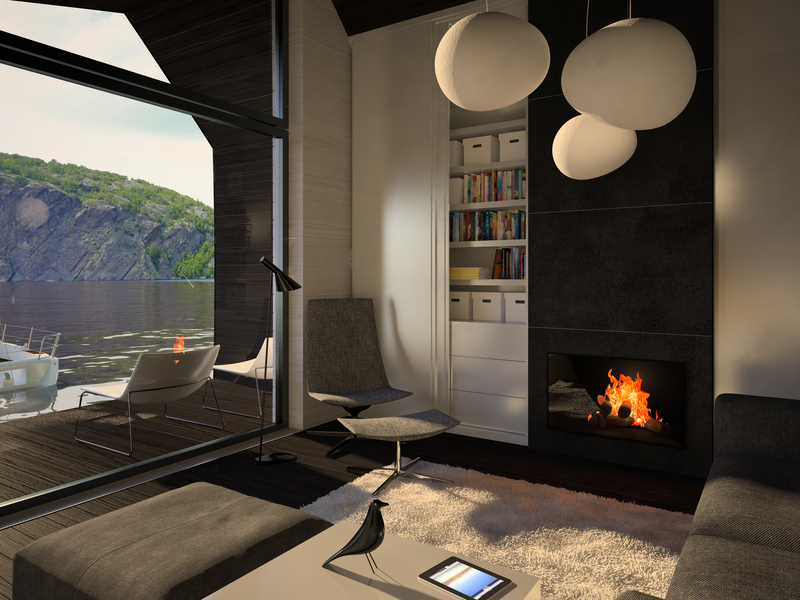 An achromatic interior scale is completed with nature colors and draws the attention to picturesque landscape surroundings as well as points to the internal room shaping. Organic materials contribute to landscape entering the house. Living room is provided with a good deal of sunlight coming through the panoramic window. Sunlight enters bedroom through the roof dormers. The windows for kitchen and bathroom are at the level of kitchen and bathroom facilities. Metal frame installed on the screw piles is a basement of the construction of the house. House altitude considers water level changes in the lake. The inner surface is wooden sheathed, the outer one is covered with folded sheet metal. Heat and water insulation is done with environmentally friendly materials. The house is equipped with autonomous engineering equipment: power supply is provided through the solar panels, heating is provided through the heat pump unit, water supply is due to the well within the site and drainage is done through the local sewage treatment plant.